DieselBike.net | Broken Fixings and how to remove them. Removing broken nuts and bolts can be a right pain if you don't have the right tools and techniques to hand. Sometimes it's wise to take the route of least resistance and junk the part rather than waste too much time on it. But sometimes that just can't be done. Maybe you overdid a bolt on your beloved motorcycle and snapped the head off or perhaps you've rounded off a nut that had become rusted on. Either way there are quite a few things you can try before throwing in the towel. Rusted on nuts and bolts ideally need to be treated and/or cleaned before you can tackle them, if only to ensure the spanner or socket fits correctly from the off. Failure can give you two problems, a rusted in fixing that now has rounded off sides! Firstly try using a wire brush to clear the red (or white) stuff away and if you can't get at the part and/or want to be really thorough, go get some rust eating Gel from your local motor-factors. Leave a blob of this stuff on overnight and chances are you won't recognise the part in the morning it'll be that clean. Once you're satisfied that your tool fits OK try and put some pressure on the fixing to see if moves. Be careful not to apply too much pressure as you don't want to break it off. Try and use six sided sockets as they grip better and are less prone to rounding off the hex sides. If you don't have any joy move on to the section below. This Gel is great at removing rust provided it's free of oil. 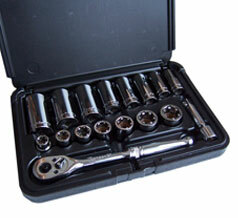 The best thing to free off fixings is a light or penetrating oil such as Plus Gas. Apply it and give it time to work its way down the thread and with any luck the fixing will be free up OK. But remember it sometimes takes many hours and many applications before it's time to break out the beers! If you don't have any of this oil to hand another trick is to use hot and cold to your advantage. Temperature changes in metal cause it to expand and contract ever so slightly and this can be just enough to free something up. If you can apply heat, perhaps with a blowlamp or heatgun, or even freeze the part (using a freezer aerosol) then this may have the desired effect. If you heat a fixing to any degree and succeed in removing it be sure to discard and replace it with a new item as it will now have lost its strength due to being de-tempered. You can also use shock or vibration to free up fixings. Sometimes a few sharp downward taps with a hammer can be enough to jar or crack to binding metals apart. If you have no joy don't be afraid to mix methods. For instance, penetrating oil works better on warmed metal. Just don't get it so hot as to cause a fire hazard when you apply it! Removing fixings which have had their heads broken off is perhaps the hardest task to do. If you're lucky then there'll be some of the threaded body still protruding from the hole and you will either be able to slot it (see Rounded off Heads section) or get some long nose Vise or Mole grip pliers on it. Make sure their serrated teeth have a good grip and gently move the tool from left to right in an effort to distort the threaded body and crack it away. Don't get too tough too soon! Sometimes, if the broken, threaded body is flush with the hole and the head was completely taken off by over-tightening, then the body of the screw itself may well be loose in the hole. It might be possible to press your thumb against it and, with a slight but repetitive, anticlockwise movement, turn the threaded section out. Or you may have success with a sharp nail if the threaded body isn't too long in the hole. Failing that, you will have to get the centre punch, taps and drill out. 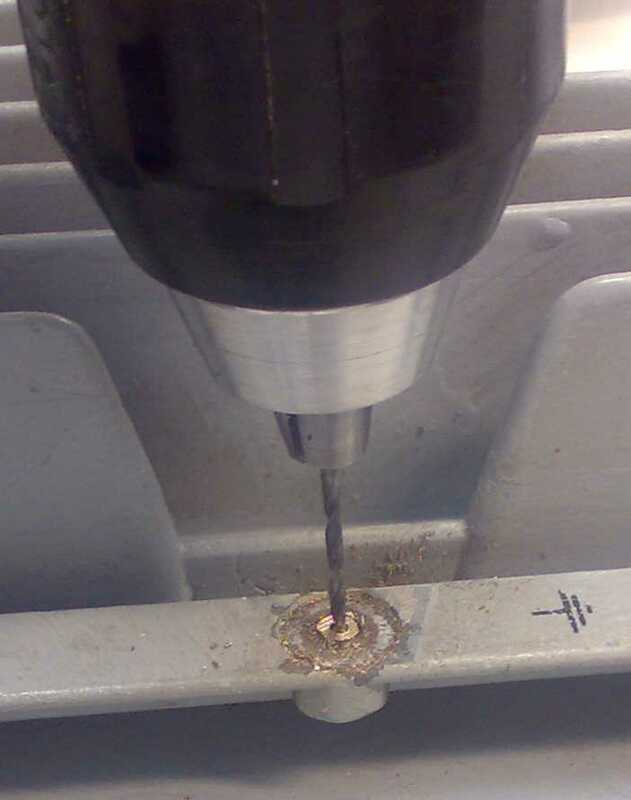 Firstly place the centre punch (an automatic version is preferable) onto the exposed, threaded body of the fixing and mark it for drilling. Then, with a steady hand and plenty of cutting oil, drill down into the fixing using progressively larger drills every time taking care not to damage the thread. Drilling and tapping is sometimes the only way to clear a thread. Check your handy work from every angle as you go to make sure you're going in straight! 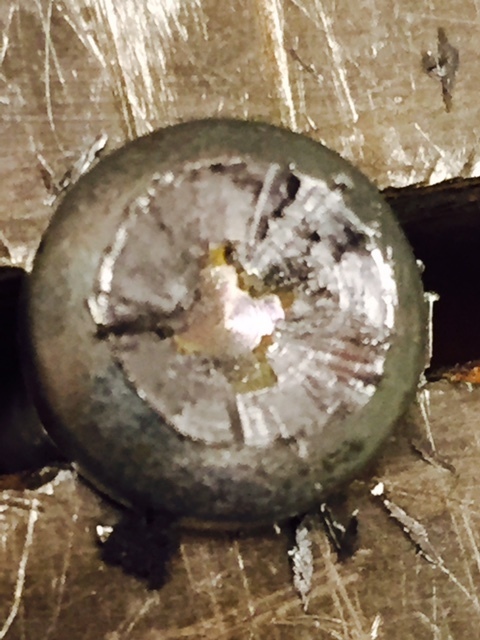 If the screw/bolt proves to be too tough for your drill you may have to go to a specialist or catalogue supplier of drills and purchase a set of high carbon bits that will be hard as hell. You won't need a full set of these, just enough to cover yourself with most thread sizes you're likely to have to drill. But it's handy to have a few spares because, as you'd expect, they take some punishment, are brittle and can shatter like glass if dropped. Here's one I did earlier. This M3 screw was Stainless Steel. I drilled it out with a 1.6mm Carbon drill before winding in the smallest of the Pull Taps seen below. It came straight out. Now you can either go one of two ways here. Firstly, if it's a big enough threaded body you're drilling into I recommend you get some Pull Taps to wind into the resulting hole. 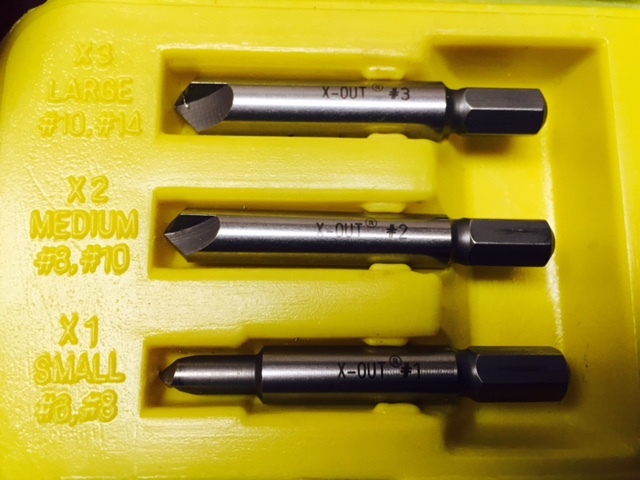 These have reverse threads set at a severe angle designed to cut into the hole you've just drilled. Unlike the other extraction bits used so far they usually have square back ends and fit into tap holders. A typical set of Pull Taps. Note the square end. 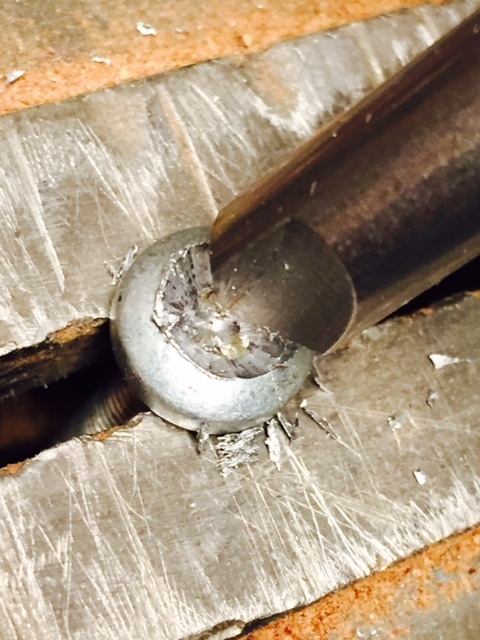 As well as keeping the original drilled extraction hole smaller and away from the threads to avoid damage, it's also advisable to do because I suspect that using this kind of tool forces out the top of the bolts body causing it to bind even more against the hole in which it is stuck. Not good. All being well you'll apply pressure and the bolt body will come out. If it doesn't then you'll have to go the second route which involves using finer and finer drills until you start touching on the thread itself. Very hard not to cause at least a little damage when doing it this way but unless it's real bad the majority of the thread left should suffice for the new bolt or screw. This is where it becomes important that you drilled dead centre to start with! and drill and tap the hole larger to take one of these repair springs. punch or pin of some kind. It's impossible to recover the smaller ones. Perhaps extreme heat may de-temper the broken tool to the point they themselves can be drilled out? I've never been there and don't want to, thank you very much. Provided you can get at them, the oldest trick in the book to fix this kind of problem is to dig out that junior hacksaw and slowly cut a slot into the rounded off head. Be careful not to go too deep with it as you'll interfere with the integrity of the screw/bolt head itself. You may have to widen the slot a touch with minimal sideways cutting action but sooner or later you should be a able to fit a bladed screwdriver into that slot and be able to give it a turn to free it. Failing that why not try a little grinding paste in the screw head? This will give that screwdriver a lot more grip when you put the pressure on. Dig out that old valve grinding kit you had and keep the paste handy because it works quite well. If you don't have any grinding paste to hand then check through all those bits you have more carefully and you may just find that you have Philips or Pozi bits with serrated edges. Yes, folks, these are designed specifically to remove stubborn screws. They are used, for instance, in the Aircraft industry. Some have just the reverse edge serrated whilst others have both tightening and releasing edges covered in a sawtooth like pattern. Remember, do apply a little Plus Gas or fine oil and let it seep into the threads before 'going to town' with these bits. And keep the oil solution off the head! 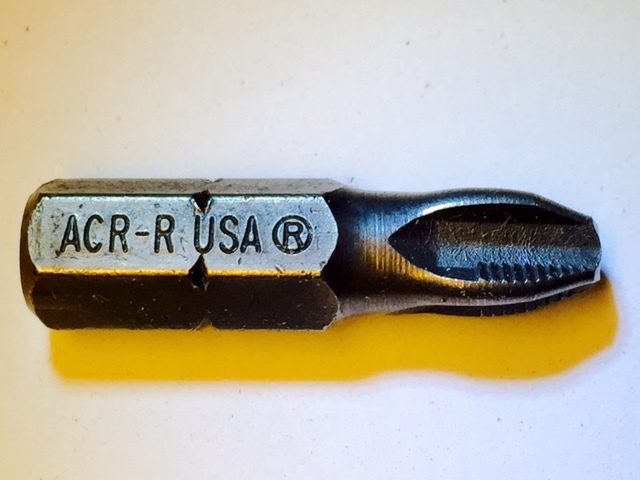 Note the serrated edge designed to grip a worn screw better. Here we see both edges serrated. If you've got to extract a hard to get out Philips or Pozi drive screw which has rounded off then you could try using a dedicated drill bit for the job. There are various brand names out there such as the Blue Point Damaged Screw Remover (YA2019) or the ProGrabit Extractor Set. Both items come in their own containers and come in three sizes. 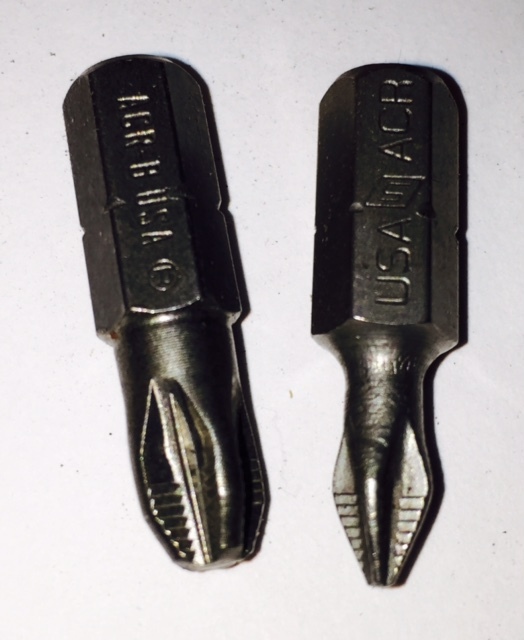 Essentially they are designed to be used in a hand held drill set to reverse drive. Press down hard and slowly pull the trigger and hope that the sharp edges cut into the head to a depth where they can get enough purchase to turn the stuck fixing. This may not happen straight away, the 'drill' having to cut its way down before the maximum surface area available from the head interacts with the extractor bit. Again, thoroughly soak the part in penetrating oil beforehand to help. ProGrabit set of three extractors. Blue Point (Snap On) extractor set. I'd be lost without a set of these in my toolbox. 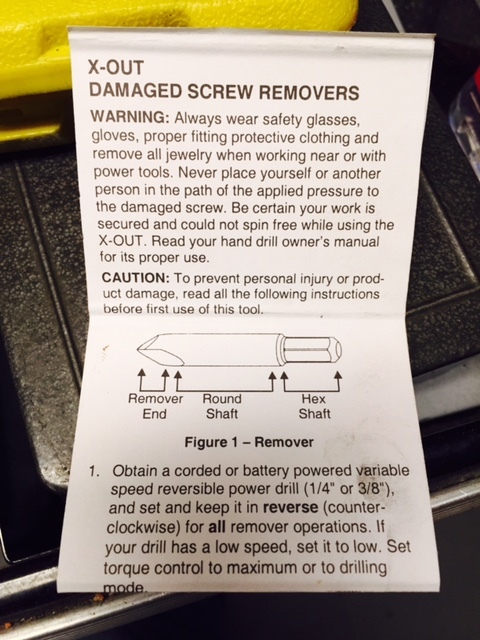 Instructions for the Blue Point Snap On X Out tools. With the drill set to SLOW & REVERSE, apply lots of pressure and the X Out will cut down until it grips enough to turn the screw (hopefully). (Note: screw held in a vice for demonstration purposes). Rounded off Hex Bolts and Nuts. There was a time when the only way to remove a rounded off nut was to drill the side or top of it to break it off. Now you can use a Nut Splitter. These devices simply sit over a nut and allow you to wind in a side screw which, as the name suggests, splits the offending fixing apart. They even make hydraulic versions should you have lots of nuts to crack off. Failing that you can go buy yourself some fancy Irwin Bolt Grip sockets which have internal, cutting threads designed to grip rounded off Hex heads and nuts. And you can also get deep reach versions of these too which is helpful. 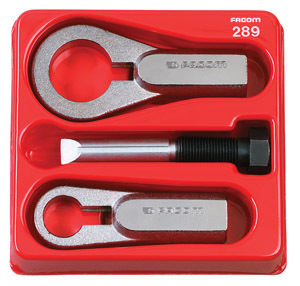 Or use some Grip Tite Super Sockets which are designed to fit most damaged hex heads be they nuts or bolts. Again, use penetrating oil beforehand to help the process. Irwin Bolt Grip sockets and Grip Tite Super Socket Set. Many people damage bolts and screws not realising that they are Loctited in. If you are in doubt as to whether the fixing is secured with Loctite then warm to whole area steadily with a heatgun before hand. Be sure to do this for some time as the heat has to penetrate into the metalwork and will constantly be drawn away by the larger frame/body of material. If possible try not to use a naked flame. The heat you apply will eventually soften the compound sufficiently for you to use any one of the other methods described here to remove the item. In the unlikely event that you can actually see what you are up against, Pink is normally graded soft, Blue medium and Green hard. That's only an approximate guide to Loctite strengths as many are available. These are a handy piece of kit to have about the workshop but before you use them make sure the tips fit snugly into the screws/bolts. They are hammer (hit) activated, hand held tools usually supplied with long hex screw bits both bladed and Pozi. Again, let some oil soak in firstly to aid extraction.If you have an air driven tool then all the better but using these on smaller fixings may well be overkill and cause more damage. Be sure to try and match metals when replacing a fixing as this will minimise the chance of rust/corrosion in the future. Differing metals corrode against each-other easily. Where possible try and use stainless fixings. There are several types on the market and they can of course be used to remove bolts or screws with broken off heads privided you can get on the shaft of the fixing. Again warm shafts before extraction in case loctite has been used to secure them! Footnote: If you want to know more about fixings in general DieselBike.net would highly recommend Carroll Smith's 'Nuts, Bolts, Fasteners and Plumbing Handbook'. ISBN 978-0-87938-406-7. Well worth a read.